Down-to-Earth Series (DTE) — addresses geologic concepts in a "down-to-earth" manner with a minimum of jargon. 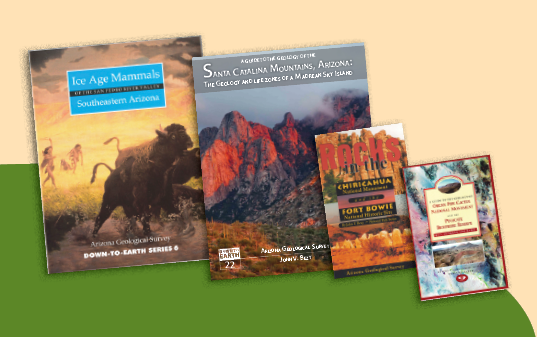 These nontechnical booklets are suitable for high-school and college earth science students, as well as adults who want to learn more about the fascinating world of geology as manifested in the Arizona landscape. Dr. Larry Fellows, Director of the Arizona Geological Survey from 1979 to 2006, was the first to envision AZGS’ Down-to-Earth popular geology series. In 1991, the series kicked off with ‘Energy Resources of Arizona’, by John Duncan and Frank Mancini. 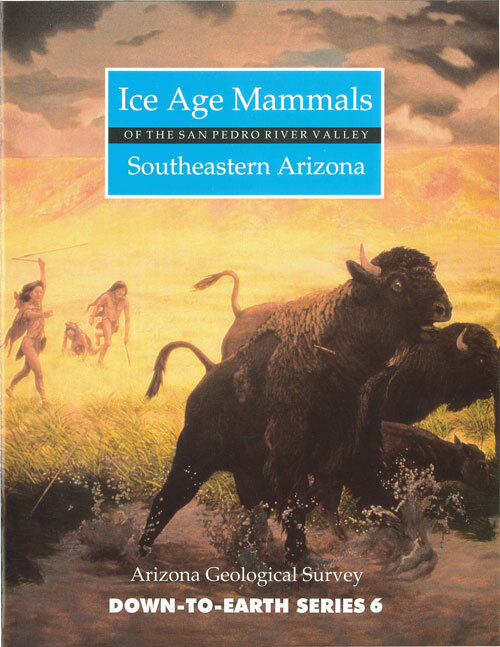 Since then, DTE booklets have ranged widely over natural hazards (radon and earth fissures), to Pleistocene megafauna grazing on the savannah of the San Pedro River Valley, to prominent geologic features at Catalina State Park, Oak Creek Canyon, Sabino Canyon, Petrified Forest and Organ Pipe Cactus National Parks, to Sunset Crater, Wupatki and the Chiricahua National Monuments. 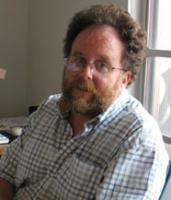 When Larry Fellows retired in 2006, Dr. Lee Allison became State Geologist and Director of AZGS. Under Lee Allison’s watch, AZGS has published five additional DTEs, rounding out the series of 22. Until recently, all DTE’s were released in printed form, either as 9”x6” or 8.5”x11” booklets. Our two latest products, Arizona is Earthquake Country and A Guide to the Geology of the Santa Catalina Mountains, were designed for digital release at the AZGS Document Repository. With our recent move to the University of Arizona and the shuttering of our Arizona Experience Bookstore, we no longer have a venue for selling or distributing books. But fortune passes everywhere; our misfortune provides an opportunity to release our remaining DTE publications online as freely accessible, high-resolution PDF documents. Please note that DTE-19, Geologic and Natural History Tour through Nevada and Arizona along U.S. Highway 93 (2012), by J.V. Tingly, K.A. Pizarro, C. Ross, and P.A. Pearthree is a joint product of the Nevada Bureau of Mines and Geology and AZGS and is not available online. We hope you enjoy these informative, illustrated texts and share them with your family, friends and colleagues. DTE-2 Radon Gas: A Geologic Hazard in Arizona, by J.E. Spencer, 1992, 17 p.
DTE-3 Land Subsidence and Earth Fissures in Arizona, by S. Slaff, 1993, 24 p.
DTE-6 Ice Age Mammals of the San Pedro River Valley Southeastern Arizona, by A.W. Amann, Jr., J.V. Bezy, R. Ratkevich, W.M. Witkind, 1997, 19 p.
DTE-9 A Guide to the Geology of Organ Pipe Cactus National Monument and the Pinacate Biosphere Reserve, by J.V. Bezy, J.T. Gutmann, and G.B. Haxel, 2000, 63 p.
DTE-10 Guide to Geologic Features at Petrified Forest National Park, by J.V. Bezy and A.S. Trevena, 2000, 48 p.
DTE-12 A Guide to the Geology of Catalina State Park and the Western Santa Catalina Mountains, by J.V. Bezy, 2002, 57 p.
DTE-13 A Home Buyer's Guide to Geologic Hazards in Arizona, by R.C. Harris and P.A. Pearthree, 2002, 36 p.
DTE-21 Arizona is Earthquake Country, by Conway F.M. and Young, J.J, 2012, 44 p.
DTE-22 A Guide to the Geology of the Santa Catalina Mountains, Arizona: the Geology and Life Zones of a Madrean Sky Island, by J.V. Bezy, 2016, 83 p.
DTE-4 How Geologists Tell Time, by E.M. VandenDolder, 1995, 33 p.
DTE-5 Things Geologic, A Collection of Writings, by H. Wesley Peirce, compiled and edited by Robin Frisch-Gleason, 1996, 39 p.
DTE-7 Highlights of Northern Arizona Geology, compiled and edited by Robin Frisch-Gleason, 1998, 44 p.
DTE-11 Rocks in the Chiricahua National Monument and the Fort Bowie National Historic Site, by J.V. Bezy, 2001, 48 p.
DTE-14 A Guide to the Geology of the Flagstaff Area, by J.V. Bezy, 2003, 56 p.
DTE-15 Roadside Geology: Wupatki and Sunset Crater Volcano National Monument, by S. L. Hanson 2003, 32 p.
DTE-16 A Guide to the Geology of the White Mountains and the Springerville Volcanic Field, Arizona, by J. V. Bezy and A. S. Trevena, 2003, 56 p.
DTE-17 A Guide to the Geology of Sabino Canyon and the Catalina Highway, by J.V. Bezy, 2004, 45 p.
DTE 18 A Guide to the Geology of Saguaro National Park, by J.V. Bezy, 2005, 36p. DTE-20 A Guide to the Geology of Sedona and Oak Creek Canyon, by Bezy, J., 2012, 44 p.